It’s been two weeks since Mysterium, and wow, I already miss you all. Is it 2018 yet? We’re looking to make a photo roundup available. If you’ve got any photographs from this year, please shoot committee an email with a link to it. We’ll be including a link to the Flickr group if you’d like to share photos there. Please note: If you’re linking us to a photo album on Facebook or Google+ or other social media, please make sure it’s not set to friends-only viewing! Otherwise there will be lots of people who can’t see them. For those of you looking for video, we’re working on it. We’ll make a post when that’s available. I think 2017 was a lovely Mysterium. We had some really awesome events, and a gorgeous hotel. Mysterium’s heart has always been its attendees, and so I’d like to issue a final thanks to all of you who attended and made this a magical time. I’d also like to thank the stream viewers for tuning into us even though you couldn’t be here. We are excited to announce that we will be streaming our events once again with Twitch. Our Twitch channel can be found here. While we make every effort to stream all of our events, we are unable to share social and unconference style events. That said, we intend to stream major events and panels, such as Opening and Closing Ceremonies, What Would Atrus Build, Cyan, Starry Expanse, etc. After the convention, recordings will be made available on our YouTube Channel. 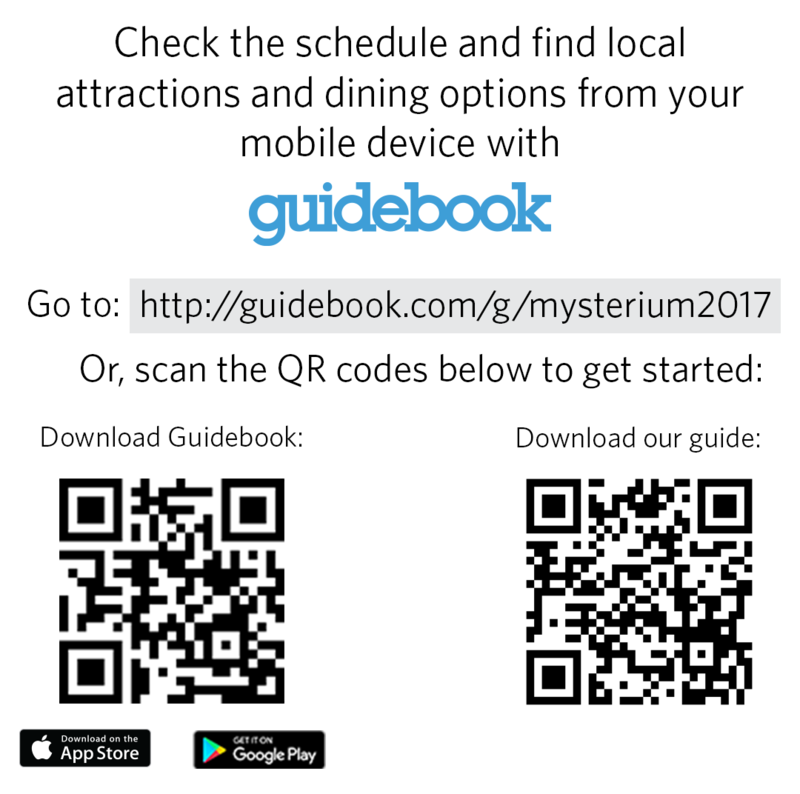 It’s one week until the start of Mysterium 2017! Are you excited? Are you full of last-minute questions? Don’t worry, the committee is here to help. We’re once again offering a mobile version of our schedule through Guidebook. If the schedule changes, we will update the Guidebook throughout the weekend. It also contains maps and info about the area, including attractions and food options. You can download it to your Android or Apple device by scanning the QR codes above. If you don’t have a compatible device, you can also access the guide from any web browser through this link. We recently sent an email out to everyone who told us they’d be bringing a car to Mysterium. 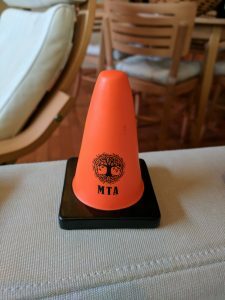 It had information about how free parking will work for both attendees staying at the hotel and those driving in each day. If you’re planning to bring a car to the hotel, and you haven’t received that email, please email the committee so that we can get that information to you. We’ll be in the Panther, Dolphin and Pelican sections of the main ballroom. Registration will begin around 9:30am on Friday, August 4, and the convention will officially kick off at 10:30. Remember, the full schedule is accessible at our website, or at the Guidebook links above. A note: Please don’t try to come into the convention room before a committee member stands outside and starts officially welcoming people in. We need to unlock the room and set up a lot of furniture and equipment, and it’s much easier to do that when we’re not dodging people ;). Feel free to socialize in the lobby area outside the ballroom as we finish getting ready. Speaking of socializing, there are many attendees who will be arriving on Thursday the 3rd so that they can get a good night’s sleep at the hotel before the con starts. In the past, people have hung out in the lobby, played games, or held an unofficial pool party to get to know each other. Likewise, a lot of people stick around through Sunday night for some extra fun. On top of that, the schedule for Friday night includes a block of time for board games and the like. So if you’ve got some small board or card games or fun activities, feel free to bring those along! There’s even talk of an unofficial knitting circle. We have some important reminders for you today. First, registration closes tomorrow, July 21st. So if you still need to register, be sure to do so ASAP here https://www.mysterium.net/registration/! Second, we still have some tickets left in three of the escape rooms. Those can also be purchased from the registration page. Finally, don’t forget to submit your questions for the Cyan Q&A and Obduction postmortem by this Sunday, July 23rd! You can find the submission form here https://goo.gl/forms/xGBKW3x5gVDFSn7G3. Can you believe that 3 Fridays from now, we’ll be at Mysterium? The closer it gets to Mysterium, the more I get asked “So what’s happening at Mysterium?” Sometimes people want the specific schedule, and sometimes people just want to know the kind of events we run. Today, I’m excited to announce the completed schedule. You can check it out here! You can also check out the schedule in more detail, including event descriptions, via our Guidebook at https://guidebook.com/guide/100590/schedule/#date/08-04-2017. Just looking at the schedule is making me excited. Mysterium is so close, and I can’t wait to see you all there. Just like last year, we have partnered with a local escape room business to book several rooms for attendees. It’s even easier this year, because the escape rooms are just across the street from the Mysterium hotel! Tickets are limited, and we expect them to go quickly, so don’t wait to get yours over at the registration page. And remember, if you haven’t registered yet, pre-registration closes in just a week! As a reminder, Cyan will be streaming a live Q&A at Mysterium. If you have a question you’d like to ask them, you can submit it here: https://goo.gl/forms/xGBKW3x5gVDFSn7G3. Getting a sneak preview of Cyan’s new home decor product line that’s supposed to be so stunning, it’ll make your guests feel like they’ve been transported to another world.